(a) Precision Lathe. It is capable of giving a dimensional accuracy up to 0.002 mm. It is used in Precision turning of previously rough-turned work pieces. It can, in many cases, easily replace a high grinding machine on account of its fine dimensional accuracy. (b) Facing Lathe. In this type of lathe the carriage is driven by a separate motor, independent of the main spindle. It carries no tail stock. It is used for machining the end faces of bulky cylindrical jobs. (c) Frontal Lathe. 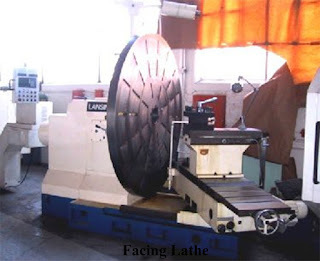 In this type of lathe, two carriages are provided- one on each end. Also two tool heads are provided. This enables machining of two jobs simultaneously. It is specifically used in machining short jobs. (d) Duplicating Lathe. It carries a special tracer attachment connected to the carriage, which moves along a template and guides the carriage. It is used for mass production of identical parts where either a previously machined part works as a template or a separate template is prepared and used for this purpose. (f) Vertical Lathe. It carries a vertical column, on which are fitted the cross slide and vertical slide. A heavy base at the bottom carries a face plate to hold the jobs. It is used for turning and boring very large and heavy rotating parts which cannot be otherwise supported on other types of lathes. 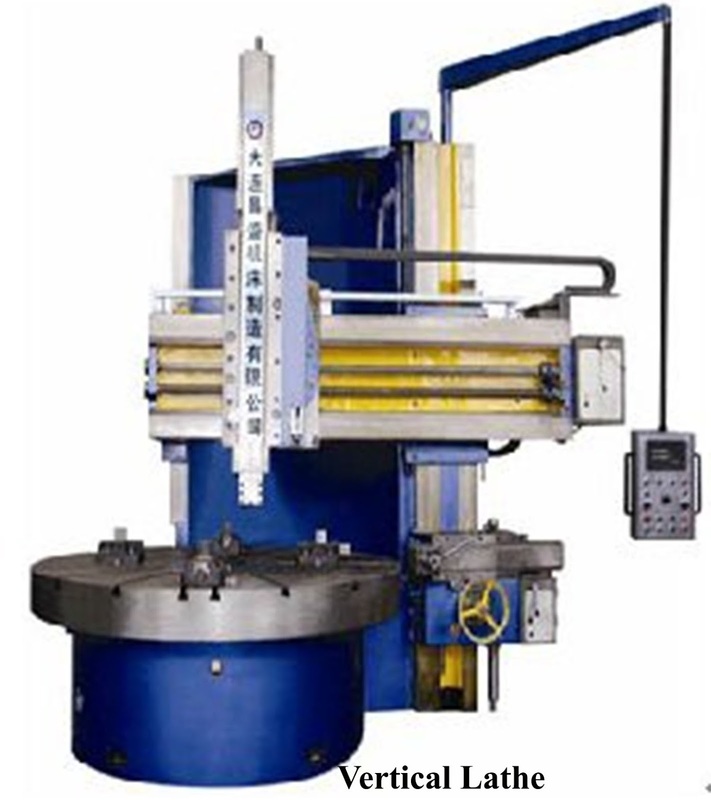 These machines are specifically employed for jobs like heavy flywheels and large gear blanks, etc. 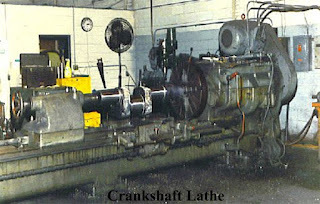 (g) Crankshaft Lathe. It carries all attachments, like taper turning and threading, etc. and in addition, a number of rests (supports) for the shaft. It is used for turning very long parts such as turbine and engine shafts and crankshafts. (h) Screw Cutting Lathe (Automatic). In this type of lathe, the machine is operated through cams and cam plates. It is used for mass production of screwed parts. Especially suitable for precision screw work. 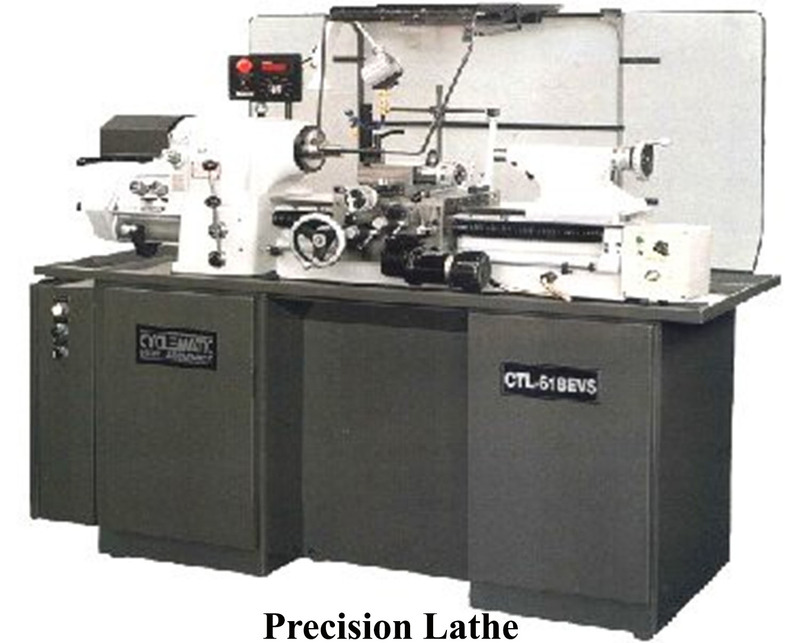 Lathe machine removes the material from a rotating work piece in the form of chips with the help of a cutting tool. Before going to other aspects, i.e. how this process is accomplished, it is necessary to know about the construction of the machine, its main parts and their functions.